RadVirtualGrid supports data filtering. Set the RadVirtualGrid.AllowFiltering property to true. Figure 1: Filtering is enabled. It is necessary to handle the FilterChanged event which is fired once the FilterDescriptors collection is changed. 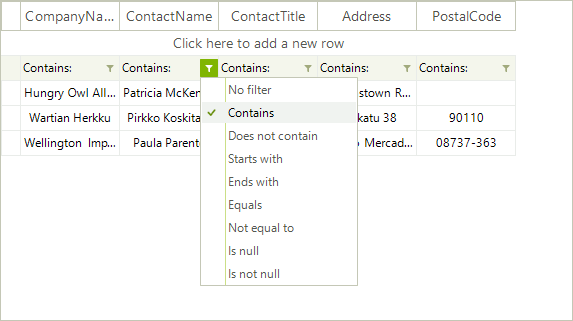 In the event handler you should extract the filtered data from the external data source. 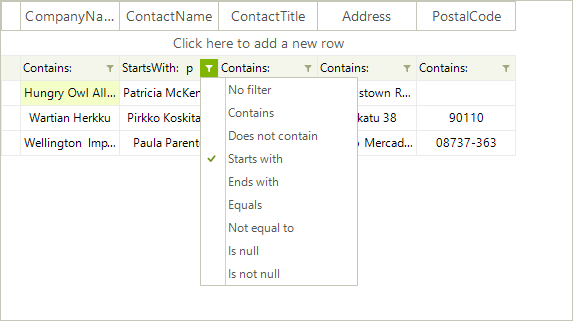 Please refer to the Populating with data help article which demonstrates how to extract the necessary data and fill the virtual grid with data. 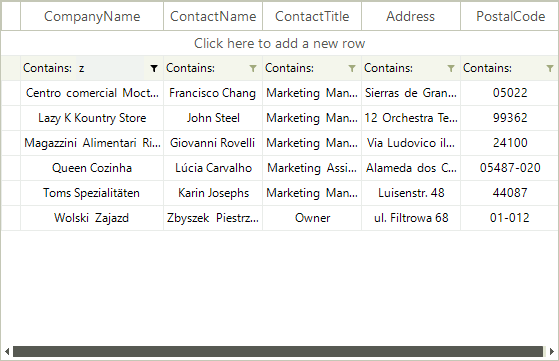 Private ReadOnly selectCommand As String = "SELECT CustomerID, CompanyName, ContactName, ContactTitle, Address, PostalCode FROM Customers"
It is necessary to specify the FieldName property for the filter cells.